There’s Gold in Them There Gardens! Well not the metallic kind but one of the most striking colours of foliage is provided by gold leafed plants. Love them or hate them, they have a big impact on a garden. 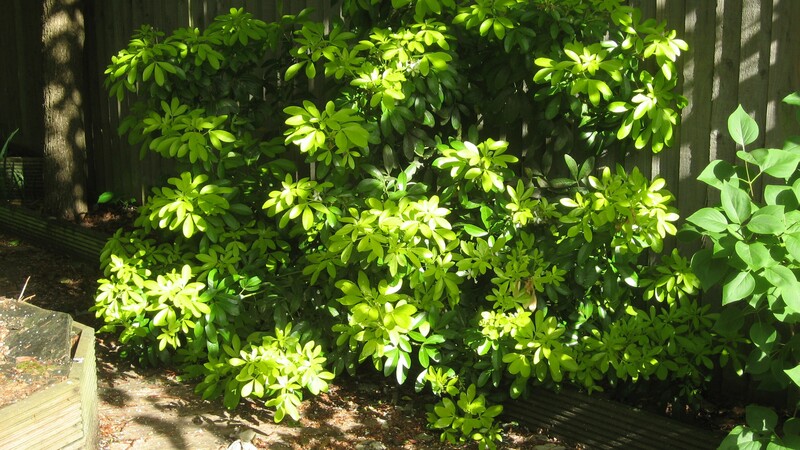 If you have a dull shady area of your garden, there is nothing better than to plant a gold leafed evergreen shrub such as Choisya ternata ‘Sundance’. From a distance it looks like there a a shaft of sunlight piercing through the tree canopy. 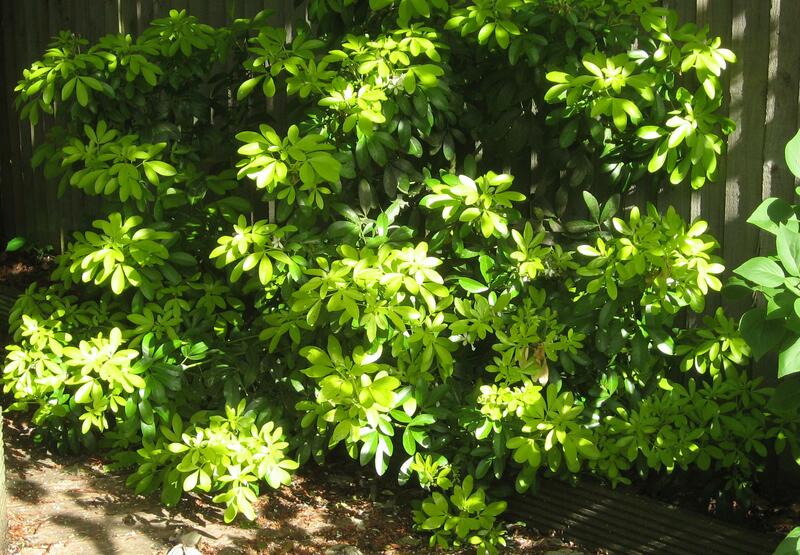 This plant is often planted in the wrong aspect of the garden giving it a poor reputation as brash and garish , however plant it in semi-shade it will look stunning. It also flowers profusely in late spring and early summer. 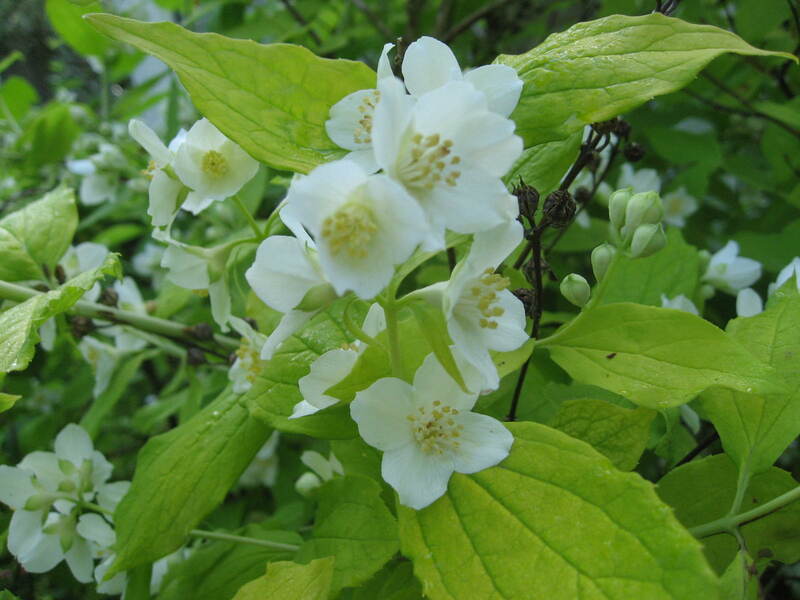 Another golden leafed plant that is in flower at the moment is the yellow leafed Philadelphis. 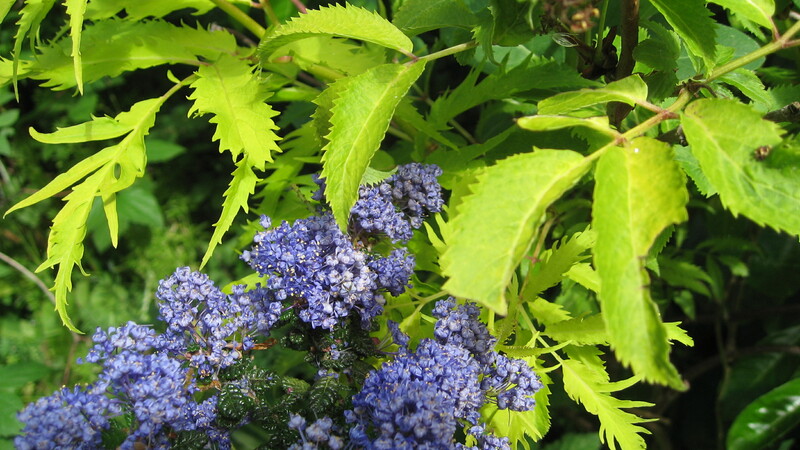 This rather splendid shrub not only looks spectacular when planted along side the likes of a beautiful blue flowering Ceanothus, but it has one of the strongest scents in the garden. It is not called mock orange blossom without reason! Underplant with Geranium ‘Orion’ and Nigella damascena (Love in a Mist) for a great effect. 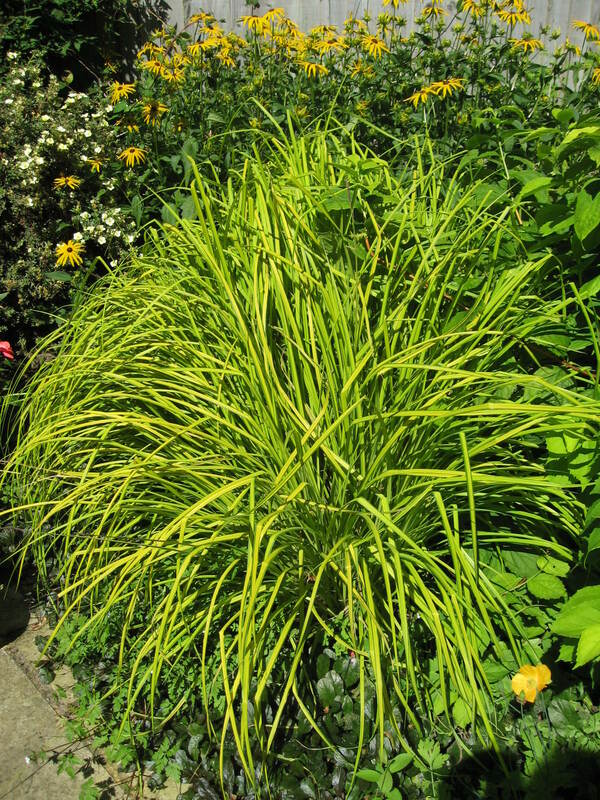 Another popular source of gold in the garden is Carex elata ‘Aurea’. A well behaved grass that looks good most of the year. Again the use of this in a blue/gold combination is stunning or adds structure to an all gold bed such as this combination alongside Potentilla and Rudbeckia. 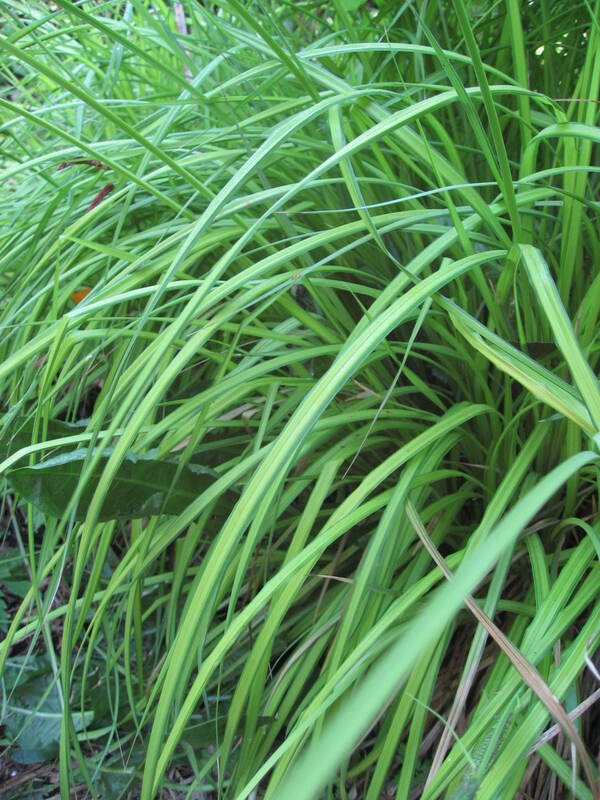 Carex elata ‘Aurea’ looks really good when combined with the glaucous leaves of Hosta ‘Buckland Blue’. The dramatic contrast of leaf shape and colour is striking. Alternatively plant it with the Russian Sage – Perovskia ‘Blue Spire’ or Nepeta ‘Six Hills Giant’ for a long lasting Wao factor. Sambucus aurea is commonly used in gold beds. Again it contrasts beautifully with Ceanothusas shown here and its delicate leaves add great texture to the garden. Up until now I have concentrated on the contrast golden foliage has with blues and purples but the versatility of these plants offers up other dramatic combinations. If you have a bold constitution, bright pinks and gold or black and gold are fantastic together although never described as subtle. The ‘Black Dragon’ Iris is a great example as is the Calla Lily – Edge of the Night, not really black, merely a very dark crimson, but stunning nevertheless. Of the true black plants, Aeonium arboreum ‘Zwartkop’ and Ophiopogon planiscapus ‘Nigrescens’ create an awesome impact of light and dark energy when plants beside golden leafed or flowering plants. 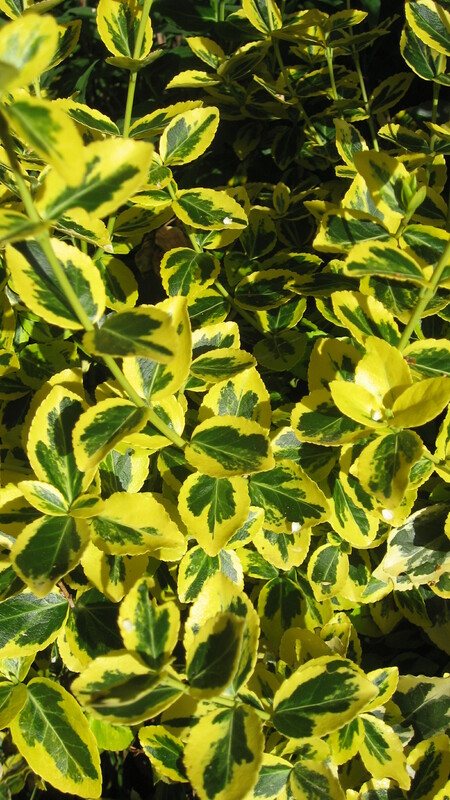 Euonymus fortunei Emerald ‘n’ Gold is one of several gold variegated shrubs. The variegated leaf adds interest to this robust and versatile shrub and is a useful link between green planting and a golden border. This plant, if given the chance, will also become a wall shrub, holding onto the brickwork. This looks really effective against red or dark bricks. 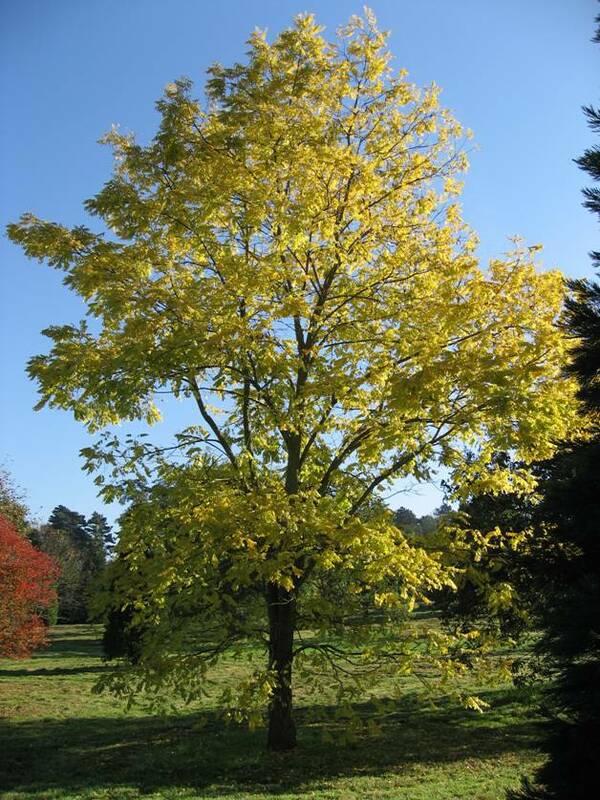 With regard to trees, there is no purer a gold than Robinia pseudoacacia ‘Frisia’. The gold leaves against a deep blue summer sky look fantastic. 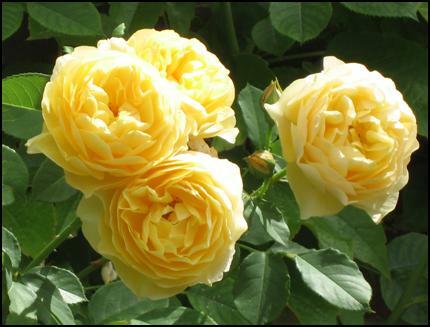 Golden flowered plants are almost too many to mention but a couple just to prove we haven’t forgotten them. 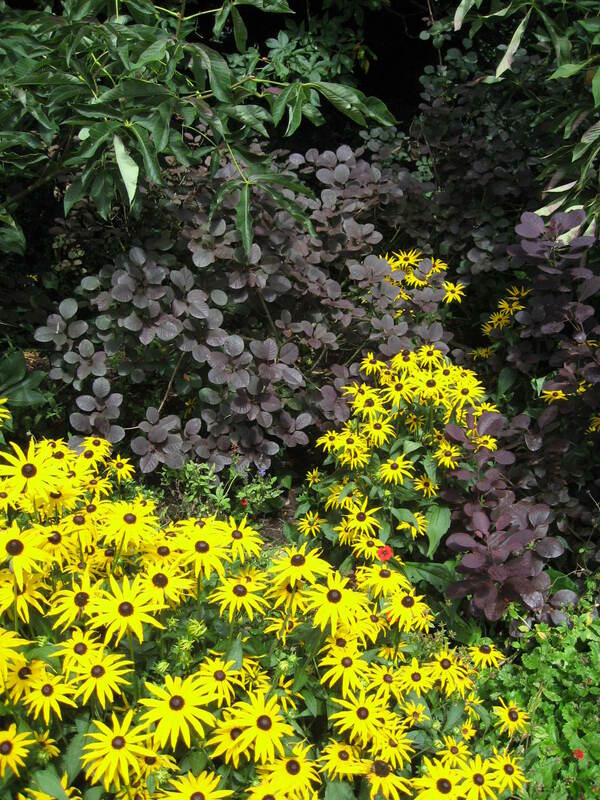 Rudbeckia fulgida ‘Goldstrum’ noted for its long flowering season, sublime with Verbena bonariensis and here with a dark bronze leafed Cotinus. Of course Rosa ‘Graham Thomas’ – why? Just because! So have fun experimenting and creating stunning effects using gold plants and soon you will discover there really is gold in them their gardens!